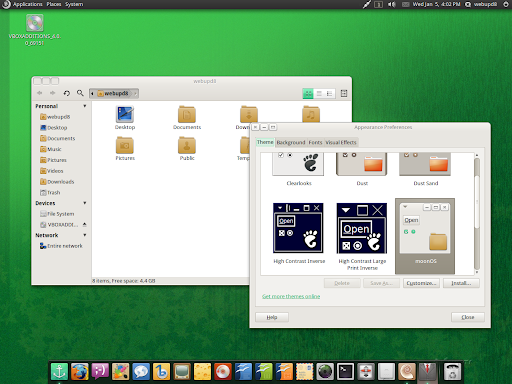 moonOS is a Linux distribution based on Ubuntu. moonOS 4 codenamed "NEAK" has been recently released, replacing E17 with GNOME for the main edition and is currently available for 32bit only. While it provides a new stylish interface by default, the most interesting new feature in moonOS 4 is the use of a new File Hierarchy System which aims to make the filesystem more user-friendly. Read on! On a first look, moonOS is not very different from Ubuntu: there are many obvious changes from Ubuntu, other then Docky instead of the bottom Gnome panel. Overall, the desktop looks very clean and polished thanks to a modified Clearlooks Revamp theme (download it from HERE), Faenza icons and Droid font which are set as default. 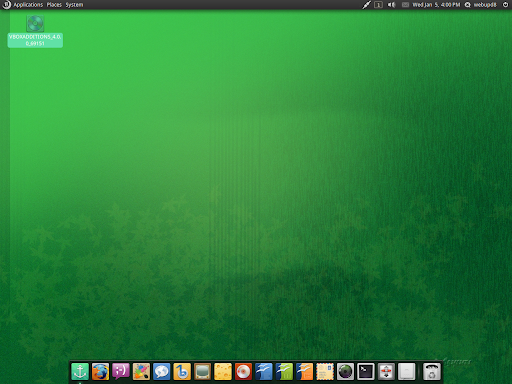 The green seems a bit too much and unfortunately there aren't many themes installed by default (Ambiance and Radiance are missing for instance) but that's because moonOS doesn't try to cover everyones taste and instead it provides only the basic stuff you'll need - for everything else there's Ubuntu Software Center which you can use to further customize moonOS. While it is designed to look good by default, moonOS is still pretty light and doesn't come with many applications installed by default - it only tries to cover the basic needs. Most of the default applications are the same as in Ubuntu, however there are some changes: Pidgin is default instead of Empaty, Banshee instead of Rhythmbox, GIMP and Cheese are installed by default and Nautilus Elementary replaces the upstream Nautilus. Other default applications include: Workspace Switcher Appindicator, Gloobus Preview, Synapse and of course Docky which you can see throughout all the screenshots in this post. Further more, moonOS comes with Linux Kernel 2.6.35 with the "200 lines" patch applied for a speed boost. moonOS uses its own file hierarchy system: all the system files are available under /System (the executables are under /System/Executables, the Libraries under /System/Libraries, the settings under /System/Settings and so on), /tmp is available under /Temporary and so on. However, the normal file system hierarchy is still there. 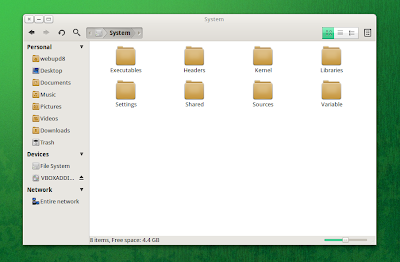 The new file system hierarchy is created with "mount --bind" (ex. mount --bind /usr/bin /System/Excutables). In moonOS there is no /home partition, the users folders are available under /Users so if you want a separate "home" partition, create it under /Users when installing moonOS. Software that use Appshell Framework will be standalone so everyone can download a single package then install it in anytime, anywhere, offline, online and easy to share with friends via Flash driver. 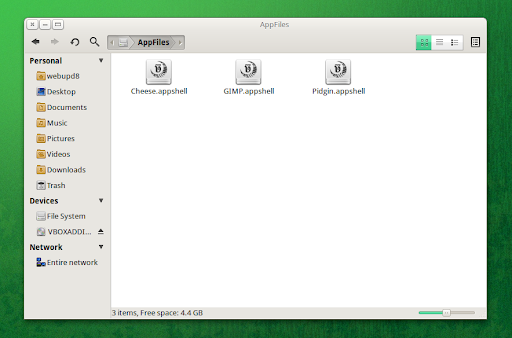 Appshell is currently in an experimental state so only 3 applications use it for now: Cheese, GIMP and Pidgin. You can find them under /AppFiles. Thanks to WebUpd8 reader Rajit for the tip!